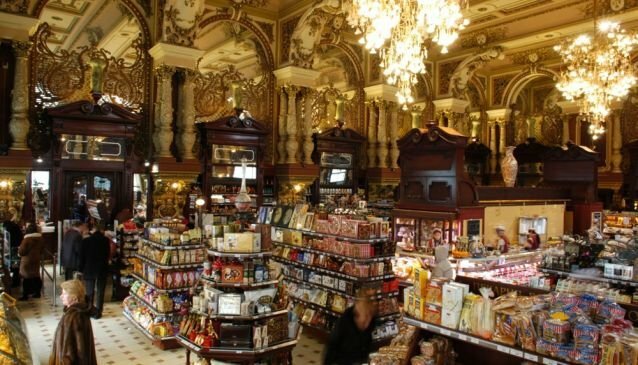 The famous grocery store 'Yeliseyevsky', opened a long time ago in 1901, is considered to be the first one in Moscow till now. Named in honour of its former owner and millionaire, Grigory Yeliseev, the store became famous not only for its big variety of products, but for luxurious decoration of sales areas in Neo-Baroque taste. Huge crystal chandeliers, reminding of bunches of grapes, decorate high archs of the sales area. Assortment of bread, pies, cakes, fancy cakes, exclusive hand-made chocolate from the own sweet-shop strike. The counter of 'Cookery' offers plenty of ready dishes, prepared by masters according to the European, Asian, Near-Eastern recipes and also russian dishes: borsch in moscow way, salad in boyarsky, sturgeon in aspic, faintly-salted salmon, baked carp, chicken-roll with prunes and cheese, mushrooms marinated, freshly-salted cucumbers, fermented tomatoes with nuts. The counter of semi-prepared food of own production makes glad the connoisseurs of home food: cool rabbit, delicate sirloin, australian marble beef, steak, beefsteak in kazachian way, cutlets in prazhsky and balkansky, home roast, meet, lamb with haricot in mexican, capsicum stuffed in kedaysky way, paparatz-kvetki made of cheese and mushroom fillet, cod in polish, pike-perch in moldavian, sturgeon shashlik. A lot of people attend 'Yeliseyevsky' every day, the other come here as if for some excursion and the administrators and shop-assistants who had special training are ready to answer all the questions. Come and make sure: modern 'Yeliseyevsky' is the sample of Russian merchant trade with correction for 21 century.